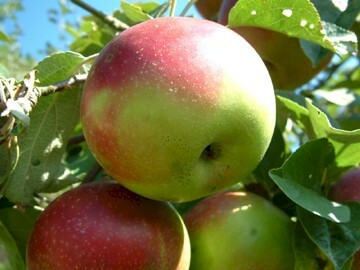 The most important commercial variety grown in the north for years, McIntosh is also a fine apple long grown and admired in many regions of the south. It was discovered in 1811 as a young seedling tree in Dundas County, Ontario, Canada by John McIntosh, an American who had recently emigrated to the area from New York state. By 1835, he was selling grafted trees which quickly became local favorites, producing apples sought after for their great flavor, dependability, and keeping qualities. The original tree at the McIntosh homestead finally blew down and died in 1910. Fruit is medium-sized, roundish to slightly flattened with smooth, thin, whitish-yellow skin mostly covered with a deep red blush. The firm, crisp, white flesh is juicy, very aromatic and sometimes stained with red streaks. Ripens September to December and is a good keeper.